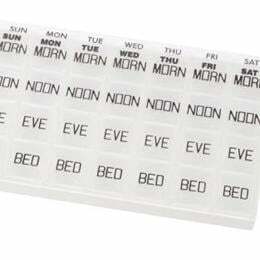 The MediChest™ Large securely holds large daily pill containers and helps to maintain a Morning, Noon, Evening and Bed medication regimen with this 7-Day tray. It features easily removable, individual dayplanners making it convenient to carry your daily medication regimen wherever you go with the MediChest Large. Each of the four tabbed compartments opens easily and snaps securely shut. Product Dimensions: 5.31" x 9.38" x 1.13"
Package Dimensions: 6.88" x 9.5" x 1.25"